Here’s our review of ProtonVPN. Needless to say, VPN tools have now become some of the most commonly found software tools on all categories of devices these days. What a VPN does, in essence, is it cloaks the IP address of your device, giving it a new identity. This means you will be able to browse the internet without the fear of prying eyes. VPNs have also found wider adoption owing to the increasing instance of cyberattacks online: users now need tools that can keep them secure online. 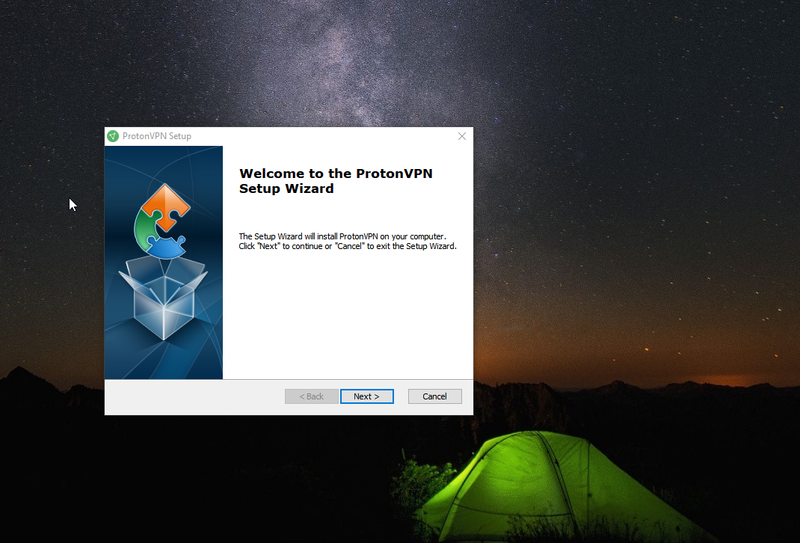 The following articles discuss the ProtonVPN tool, one of the most powerful VPNs available in the VPN space today. We conduct extensive tests on the tool and bring you the pearls of wisdom to help you decide if this indeed is the best VPN for your devices. The following table lists the most important features of the software for you to have a broad overview at a glance. One of the most common reasons people purchase VPNs is to unblock geo-restricted content on streaming services such as Netflix and Hulu. We tested the VPN in this regard and the following are our observations. With Kodi there’s no unblocking of course, but, having a VPN in place ensures your data is not leaked to the ISP. As you can see, connections to streaming services are uncertain. Don’t be surprised if you are able to connect to Netflix one fine morning and are blocked the very next minute. When unblocking geo-restricted servers, it is also imperative to choose the right server for the best performance. It is also important to note that this is a largely uncertain area in the VPN space, for streaming services working today might suddenly stop working tomorrow. The table below presents the most important pros and cons of the software. We this, we conclude a basic overview of ProtonVPN. Let’s now examine the software in a greater deal through our tests. 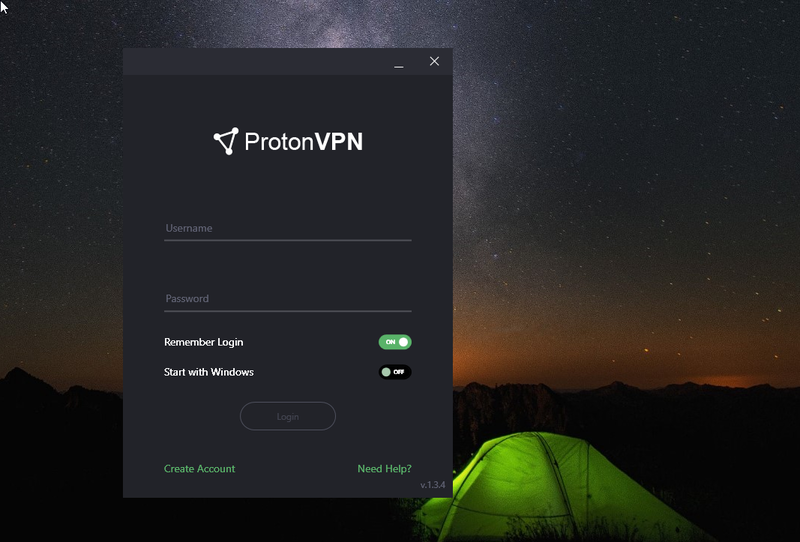 The following is an in-depth review of the ProtonVPN tool, which is based on our extensive tests. We examine the various features of the software in great detail beginning from download and installation, testing the speed performance, evaluating the security and privacy, the most important features, and finally the pricing plans available. We tested the 1.3.4 version of the software on Windows 10. ProtonVPN is supported on a number of different OS platforms. Our Score: 10/10. ProtonVPN can be installed on a number of different devices- Windows machines, Macs, Linux desktops, as well as iOS and Android devices. The security net thus spans far and wide and you can rest assured there’s a level of protection for every device. Different pricing plans support varying number of devices the tool can simultaneously run on. The ‘Visionary’ plan, for instance, can be run on 10 devices. The ‘Plus’ plan, on the other hand, can support 5 devices. It’s easy to install ProtonVPN on all your favorite devices. The process is simple and straightforward, taking a few minutes at the most. Our Score: 10/10. In order to install ProtonVPN on your system, proceed to the official website of ProtonVPN and head to the ‘Downloads’ section. The download would complete in a few minutes. Double-click on the installer file to begin the installation. Click on ‘Next’ button to begin the installation. The process would finish within a few seconds. You’ll next see the login screen. Enter your credentials, if you’ve already purchased a subscription, and if you have none, sign up/create an account for buying one. Once you sign in, you’ll be taken to the software dashboard. Overall, the installation process is simple and easy to follow. ProtonVPN has several prominent features, especially those concerning security and privacy. Our Score: 9/10. ProtonVPN boasts of a number of critical security features. Take the Secure Core function, for instance. This feature ensures that in case a VPN server gets compromised, the user data is still in secure hands by using a special Secure Core network through which all data is passed first. This includes countries such as Iceland and Switzerland. What the feature does is that it ensures the real IP address is never revealed even if the VPN service is compromised. This is as against other competitors in the market, which lack such functionality. Perfect Forward Secrecy is another important feature- strong encryption protocols are used along with ciphers with perfect forward secrecy, which implies that in the event the key is compromised, the data traffic cannot be decrypted at a later stage. The tool is Swiss-based. Switzerland is recognized for its strong privacy laws, being outside of EU and US jurisdictions. A strict no logs policy ensures no traffic logs are stored, thus keeping your browsing activity secure online. 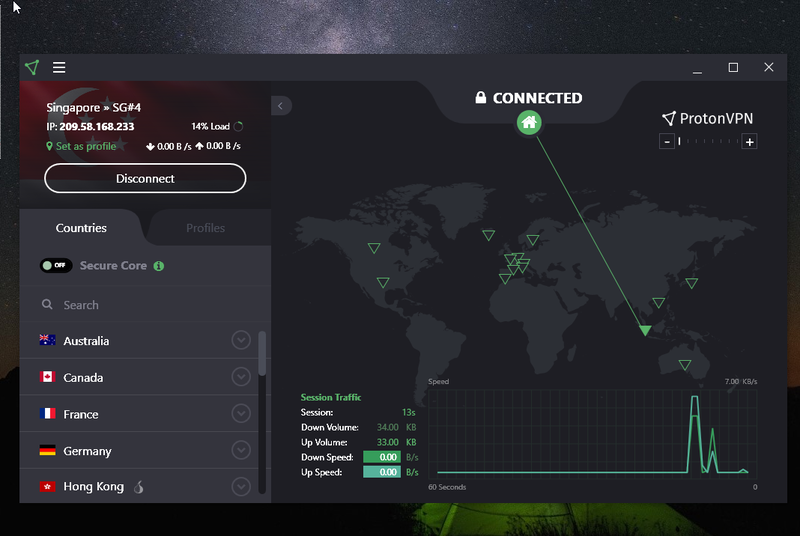 ProtonVPN is easy to use and has a cleanly laid out, intuitive user interface. Our Score: 10/10. ProtonVPN has a highly intuitive user interface- you’ll have no issues navigating around the interface to find the desired controls. The main interface features a map overlay along with data analytics at the bottom, showcasing the data speeds over the network. On the left pane is a choice of country servers. Connecting to the VPN servers is easy: if you wish to connect with one click, choose the ‘Quick Connect’ option and the software will automatically choose a server for you. Proceed to the options button on the top of the interface to navigate to the ‘Settings’ section. It is evident that the software lacks deep levels of customization, which are found in many competitors. There’s an option for starting the tool on system startup. You can also configure the tool to start minimized and enable the auto-connect feature. A feature worth special mention is the VPN Kill Switch- this is an extremely important tool, which automatically disconnects all internet connections when it identifies that the VPN functionality is no longer available. This ensures no accidental data leaks ever occur. Finally, you will also be able to choose the VPN protocol from the drop-down menu on this screen. ProtonVPN offers a choice of 315 servers in 27 countries around the world. Our Score: 10/10. ProtonVPN does not have as vast a network of VPN servers as many of its competitors. However, it must be remembered that with a VPN, it is essential to have well-optimized servers, which might be fewer in number- this is always better over having a large number of poorly configured servers. The ProtonVPN network spans 27 countries around the world, featuring 315 servers. The network has a capacity of 155 Gbps. One of the most important aspects of ProtonVPN is the Secure Core network, which routes internet traffic through multiple servers. As noted in the recent blog post, Secure Core’s coverage now spreads across 23 countries in total. Using these servers, your traffic first goes through a nearby Secure Core server before being routed through the end server. ProtonVPN offers a moderately fast VPN service, which serves most purposes well. Our Score: 9/10. ProtonVPN uses configured servers that deliver an optimal speed performance. We subjected the tool to a speed test to evaluate real-world performance. First, we run the baseline speed test with the VPN turned off to obtain a reference speed level. The network is moderately performing at the moment. Let’s now turn the VPN on and connect to a non-US server to evaluate performance. It’s now time for the speed tests with a US server. Let’s connect to one and run the tests once again. Here are the results. It’s clear that the VPN slows the network down. However, the performance is highly dependent on the VPN server chosen. It is also important to understand the speed tests depend on the prevalent network conditions at the moment, which can keep fluctuating. It is important to thus recognize these speed tests in this light as a useful guideline only. ProtonVPN excels most in its privacy and security features. Our Score: 10/10. ProtonVPN has a number of security and privacy features that make it stand a class apart when compared to its competitors. Let’s examine the main security features of the tool in greater detail. ProtonVPN features AES-256 encryption. A powerful feature inculcated in the software is the Secure Core network, wherein, all data traffic, encrypted, is routed through multiple servers. This ensures that in the event a VPN server is compromised, the user data is still secure since the real IP is never revealed. Forward Secrecy is another powerful feature in this regard, under which, a new encryption key is generated for every session. This means that no data can be held captive and later decrypted if a future session gets compromised. The software uses OpenVPN VPN protocol, recognized for its security. It does not support easier to implement yet less secure protocols such as PPTP and L2TP/IPSec. Another critical feature is hardware security- this is another feature unique to ProtonVPN, wherein their data centers are afforded physical security as well. In fact, the Swiss center is located in an army fallout shelter about 1 km below the ground surface. This lends the tool an additional level of security at the hardware level, difficult to match elsewhere. ProtonVPN respects user privacy and does not log any user data. As per Swiss laws, the company is not required to maintain any connection logs. User data logs can never be provided to any third party no matter what. DNS Leaks are a common phenomenon- in fact, many VPN tools can accidentally leak user data. The DNS Leak test allows us to test VPNs and ensure no user data is leaked. The result is clear, ProtonVPN is not leaking any DNS data and passes the test. ProtonVPN provides extensive online resources and support channels. Our Score: 7/10. ProtonVPN has a rich repository of online resources and documentation, which can come in handy when seeking solutions to your problems. 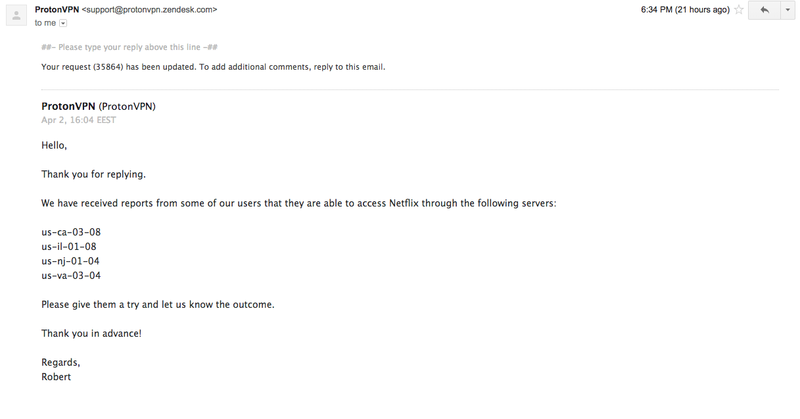 We contacted ProtonVPN support and received their response some hours later. It is also important to consider the global timezones when evaluating customer service, so this is an important point to keep in mind. ProtonVPN allows for many pricing plans, which can be chosen based on one’s personal preference. Our Score: 10/10. The software scores a perfect 10 owing to the fact that it has economic plans in addition to a completely free of charge plan as well, which is a rare offering amidst VPN software. The above plans are all monthly subscriptions- users could also choose the annual plans, which are less costlier. However, with VPN tools, it is important to note that monthly plans are the best bet since VPNs operate in an area where services and offerings can quickly change. For instance, streaming services working today might suddenly stop working tomorrow. ProtonVPN delights users of all levels: beginners, advanced users, and professionals. There’s something for everyone. Who Should Use This VPN? Those looking out for the best VPN with the most powerful security features. It does not get any secure than this. Final Verdict: 9.44 out of 10! 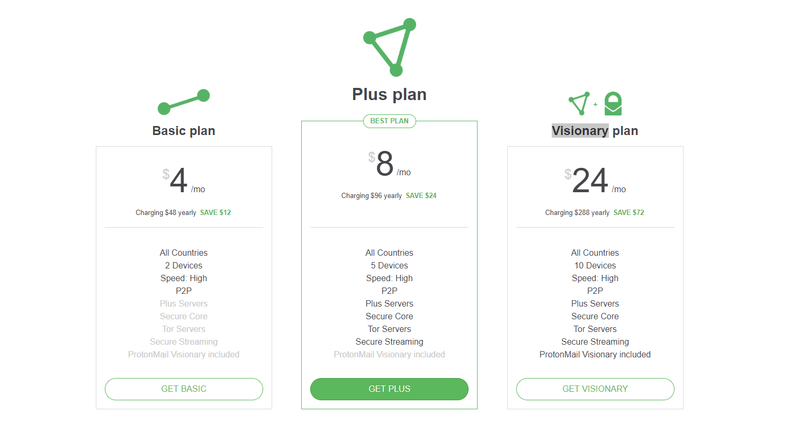 If you’ve made up your mind to purchase ProtonVPN, head to their official website and choose a plan that best suits your needs. 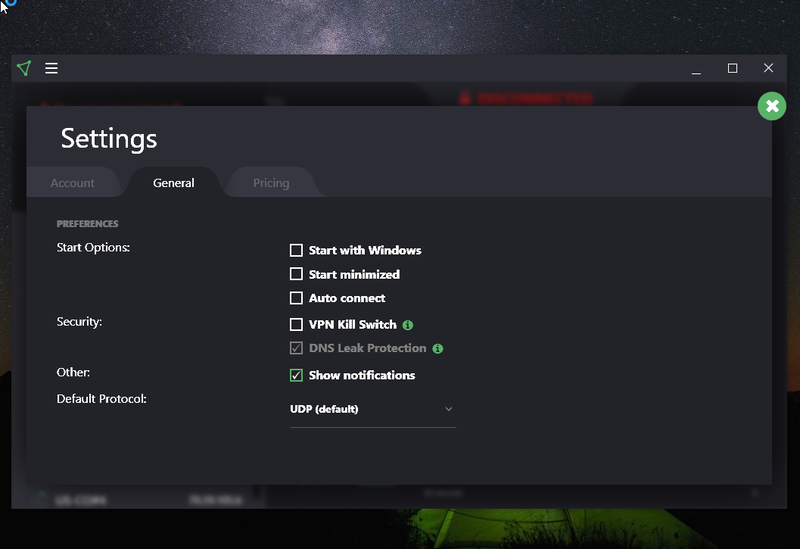 ProtonVPN is the perfect tool to enhance your PC’s online security. Why just PCs, it can, in fact, protect all your devices by cloaking their IPs and giving them an untraceable virtual identity, thanks to the Secure Core functionality. The tool is easy to use and performs well in our speed tests. With this, we conclude our review of the ProtonVPN software. We hope you’ve found our review useful- please consider sharing our review in your social circles. Should you have any query, please leave us a comment and we’ll get back to you right away. ProtonVPN is one of the most secure VPNs in the market today. Easy to use and power-packed, this one won't disappoint you. Highly recommended for its multiple levels of protection and security!